Maserati is just now getting around to offering a certified pre-owned program, which isn’t surprising since historically Italian cars and reliability didn’t often go together. But if you want a depreciated Maserati and worry about repairs, a CPO car could be just the thing. Once certified, the warranty is extended to six years and unlimited miles from the original service date. That’s right, you can buy a Maserati with an unlimited mile warranty. 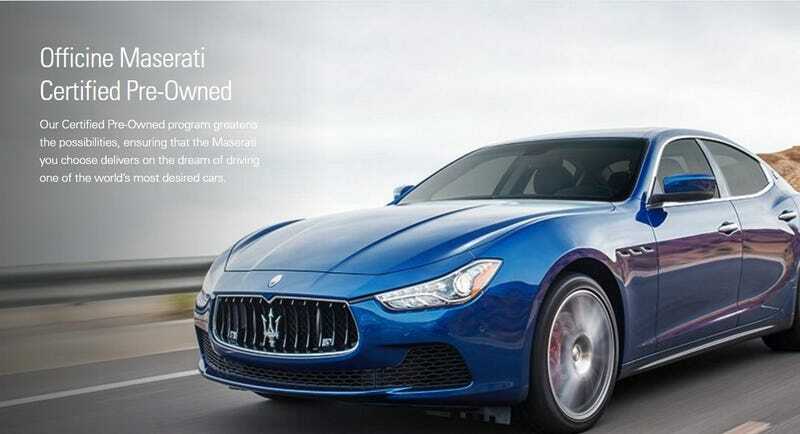 While Maserati does not explicitly say this is an unlimited bumper-to-bumper warranty, the coverage does cover the following components: engine, transmission, differential and driveshaft, suspension, steering, brake system, cooling system, fuel system, electrical components and climate control system. That’s pretty extensive. For car people who like the cars that are Italian and that go “vroom,” this is an incredible opportunity to get some Italian hardware at a reasonable price without having to drain your 401k to afford the repairs. For example, this 2014 Maserati GranTurismo Sport originally retailed for about $130,000. It can be yours for under $66,000 and since it has fewer than 30,000 miles it qualifies for the CPO program. While the GranTurismo hasn’t changed all that much over the years, a 2014 model looks almost identical to a 2017, so few people will know that you didn’t spend full price for a new one. And let’s not forget that this coupe comes with the Ferrari-derived V8 that sounds absolutely incredible. If you find an example that still has a warranty balance, you can ask the dealership if the car could be sold as a certified model for an additional cost. In the ongoing debate as to whether or not certified pre-owned cars are worth the premium, paying a little more for a Maserati CPO is probably worth the investment.